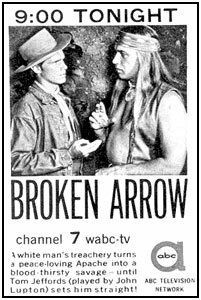 Do You Remember... "Broken Arrow"
One of the huge ratings successes of the Fall ‘56 TV season was ABC’s sympathetic presentation of the majestic Indian leader Cochise, played by then 33 year old Michael Ansara, and his relationship with his white blood-brother, Indian Agent Tom Jeffords, played by then 31 year old John Lupton, on “Broken Arrow”. The half hour b/w series was preceded on Tuesday nights by already-established-a-year-earlier ratings winners “Cheyenne/Sugarfoot” and “Wyatt Earp”. “Broken Arrow” had been a major motion picture success for 20th Century Fox in 1950 with James Stewart (as Jeffords) and Jeff Chandler (as Cochise). As John Lupton explained, “Fox decided to make an hour version of the movie for their ‘20th Century Fox Hour’ on TV. Ricardo Montalban played Cochise and I played Jeffords. (The program aired 5/2/56 on CBS). Irving Asher, in charge of 20th Century Fox production, chose me from a year old screen test I’d done with Carol Ohmart. ABC became interested and decided to make it a series.” Montalban apparently wasn’t available or didn’t want to commit to series TV, so Michael Ansara was selected. The 6' 3" Ansara had been a pre-med student who took acting classes to overcome his acute shyness and fell in love with the profession. “Broken Arrow” depicted Tom Jeffords’ long struggle against the blind prejudice white men felt against the Apache nation led by Cochise in 1870’s Arizona. 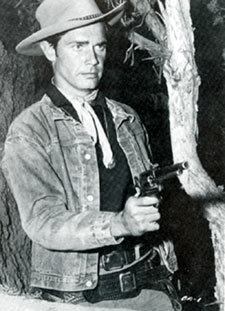 The first three episodes of the series follow James Stewart’s “Broken Arrow” film closely. In “The Mail Riders” Jeffords must safely get the U.S. mail through Arizona’s Apache territory, persistently faced with attacks by the Indians. He does so by befriending Cochise. “Battle at Apache Pass” concerns white men attempting to lynch Jeffords thinking he’s betrayed them to Cochise. 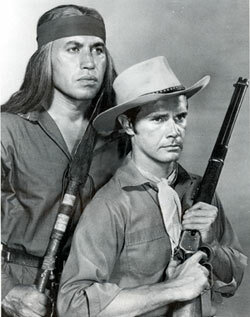 With “Indian Agent”, Jeffords seeks help from Cochise in fighting Geronimo’s renegade band, agreeing to serve as Indian Agent on the Chiricahua reservation. The series began 9/25/56 and ran for two seasons, 72 episodes, til 6/24/58. John Lupton died 11/3/93. 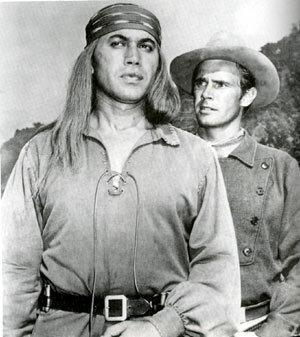 Michael Ansara will be 90 on April 15, 2012 and lives in retirement.